The proportional pressure reducing valve PDMC10S30P is a pilot-operated, 3-way spool-type valve. When it has no energy, it vents the port 1 (consumer) via tank port 3. The pump port 2 provides a constant small flow of pilot oil to tank port 3. When the inlet pressure and the volume required fluctuates, it provides an almost constant outlet pressure – depending on the energization of the coil. Plus, when the control current increases, the solenoid coil exerts a force via the pilot line on the pilot spool. Thereby, this will connect port 2 (consumer) with pump port 3. This will also compress the reset spring of the control spool. So, if as a result of external factors, the pressure at port 1 rises above the preset pressure, the valve opens from port 1 (consumer) to tank port 3. This reduces the flow from pump port 2 to port 1 (consumer). 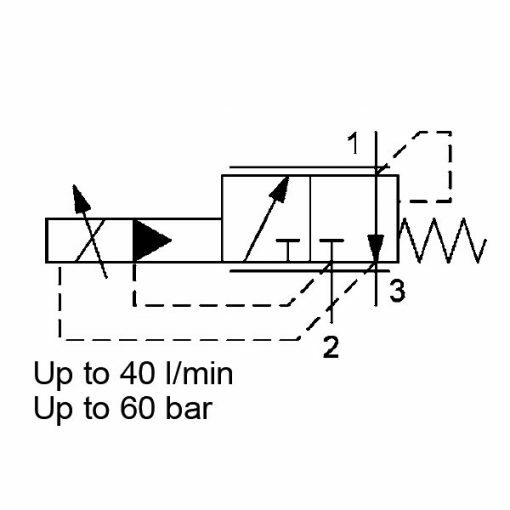 This reduction will happen until the pressure across port 1 is equal to the pre-set pressure value. What’s more, any pressure at tank port 3 is additive to the pre-set control pressure. A control pressure reduction is possible right down to 0 bar.